The wait is over. Following a two-and a half month retooling and renovation, Kepler’s opened its doors this morning at 11:00 am. 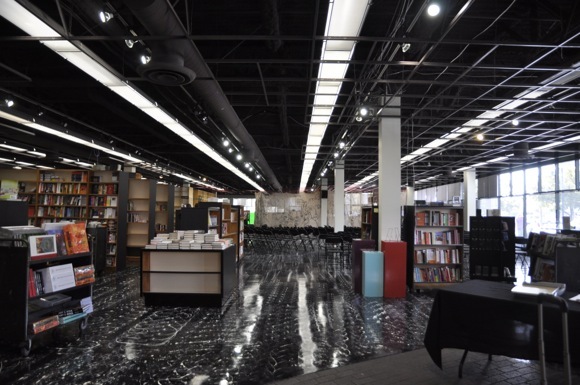 Shortly before, we got a sneak peak while staff was still busy restocking the book shelves, which included a quick visit with the husband and wife team of Christin Evans and Praveen Madan, who describe themselves as “trustees” of Menlo Park’s iconic, independent book store. “Kepler’s is a community-financed and community supported institution,” said Praveen, who, along with a transition team, launched Kepler’s 2020 last January. The initiative created a hybrid business model that includes a for-profit, community-owned-and-operated bookstore and a nonprofit organization that will feature on-stage author interviews, lectures by leading intellectuals, educational workshops and other literary and cultural events, including fundraising for schools and book swaps. Christin characterized the next few weeks as a soft opening. “We’re planning an official launch sometime in October,” she said. A full line up of events is planned between now and the end of the month, including a sold-out appearance today by Salman Rushdie and the relaunch of the Mystery Book Club tonight at 7:00 pm. Author T. C. Boyle speaks Wed., Sept. 26 at 12:30 pm; Sarah Mass headlines a teen event on Sept. 27 at 7:00 pm; author Carissa Phelps talks on Sept. 28 at 7:00 pm; Phyllis Theroux holds a writing seminar from 1:00 to 3:00 pm on Sept. 29; Story time at 11:00 am on Sept. 30 features Sue Fliess. Current book store hours are 10:00 am to 5:00 pm.